Often the probability of an accident is determined both by the behavior of the person who ends up being uninjured by the accident ("the tortfeasor") and by the behavior of the person who ends up being injured ("the victim"). 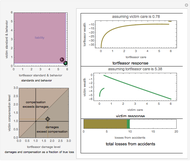 In this "bilateral accident model," the legal rules frequently assess liability based on both tortfeasor and victim behaviors at the time of the accident. This Demonstration taken from the field of law and economics lets you set the legal rule for determining liability, damages and compensation, and the behavior of the parties. It shows the optimal behavior of the parties given that legal rule as well as the total expected loss to society resulting from the behaviors. 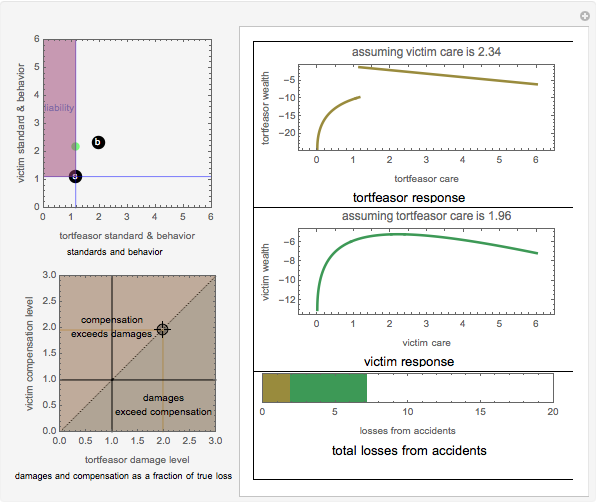 The graphic at the top right shows how the wealth of the tortfeasor would vary as a function of its care given the care level of the victim, the standards for liability, and the damages assessed in the event of liability. 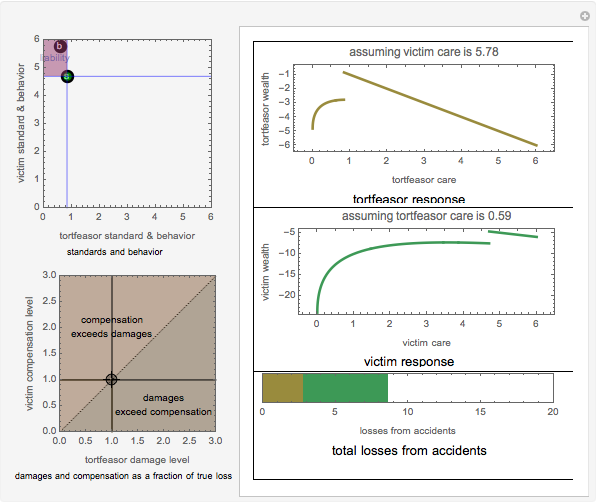 The graphic at the middle right shows how the wealth of the victim would vary as a function of its care given the care level of the tortfeasor, the standards for liability, and the compensation awarded in the event of liability. 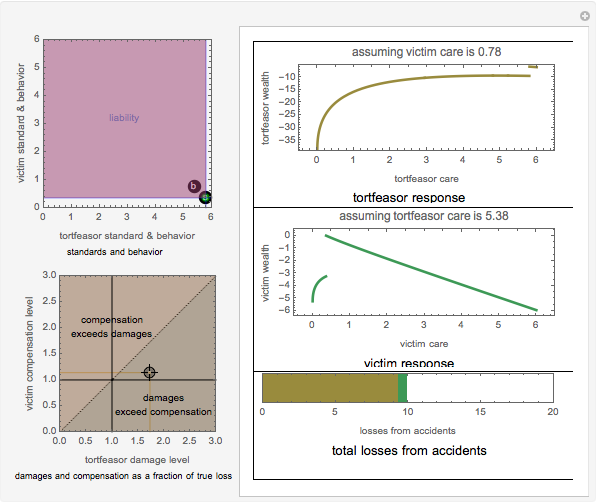 The graphic at the bottom right shows the losses to tortfeasor (gold) and victim (green) given their current behaviors. The control on the top left lets you move a locator marked with an "s" to set the standards of care required of the tortfeasor and victim and a locator marked with a "b" to set the behavior of the tortfeasor and victim. The control shows the area of liability in a transparent purple and shows the best responses of both players to the complementary strategies by a green dot. By chasing the green dot with your "b," you can create a Nash equilibrium solution in which the behaviors of the players are mutual best responses to the others' strategy. The control at the bottom left lets you set the damages the tortfeasor will have to pay if found liable and the compensation the victim will receive if the tortfeasor is found liable. Both values are stated as a ratio of the true loss to the victim. Try to find standards of care for which the Nash equilibrium behaviors result in the lowest total losses from accidents. 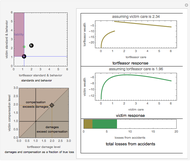 The model makes a number of simplifying assumptions, including (1) that both tortfeasor and victim are equally risk averse; (2) the tortfeasor has assets with which to compensate the victim; (3) the legal system perfectly determines the levels of care of the tortfeasor and victim; (4) no insurance is available to transfer risk; and (5) the tortfeasor and victim are perfectly rational. The model further assumes that the tortfeasor and victim are symmetric in their abilities to reduce the probability of an accident and that their efforts to reduce accidents exhibit decreasing marginal returns, that is, the second partial derivatives of the probability function are negative. Seth J. Chandler "Bilateral Accident Model"